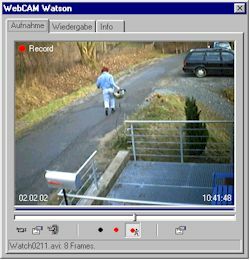 Motion controlled video monitoring with quick-motion picture for observation. WebCAM Watson is a perfect video monitoring system for your PC. Day-long observations diminish to minute length. WebCAM Watson takes single pictures in adjustable temporal distances of the WebCAM. These pictures are converted to a AVI video with 25 frames per second. Thus a quick-motion picture is created, with which long procedures can be controlled very fast. Any capture device, a WebCAM or a normal camera, attached to a frame grabber card, can be used. WebCAM Watson runs in the task bar of Win 98/Me/XP/NT/2000. It does not consume any place on the desktop. With one doubleclick on the icon in the task bar the WebCAM Watson window with the camera picture becomes visible.